It’s Leslie Maniotes – author of the GID series on the blog this week. EVERYbody is gearing up for their new year and few have time to take on the blog this week. So, I am lucky to have a week to share some new thoughts and experiences from working with the professional development side of GID. One of the best aspects of Guided Inquiry Design, and perhaps the most scary for teachers, is that students learn by asking their own questions. We know that student curiosity and questioning is at the core of all inquiry based learning. The best designed inquiry learning supports all students through the first three phases to help students to arrive at an intellectually stimulating and interesting question on the content standards in the unit of study. I knew that high level questioning was happening in the schools, classrooms, and libraries where I have worked with excellent educators to know how to use this model to design their inquiry based learning. So, I asked my GID crew- who are AMAZING! And, of course, I got responses from each level High School, Middle School, and Elementary level. REAL questions from REAL kids about the content under study. In the next three posts I’ll share those questions and some reflections on them in order to help you to …. Side note – do you know the history behind this poster? 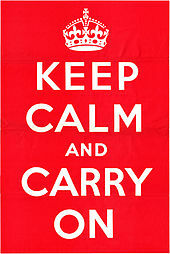 It’s a fascinating relic from WWII – an actual poster of British war propaganda. Find out more here. Enjoy that video and come back tomorrow for more about students real questions in GID! In education, especially at the beginning of a school year, new initiatives or pilots of new initiatives are rolled out. It may be a new online grading program, new textbooks, a new method to contact parents, the list rolls on. Some of these initiatives are just a flash of light – here one year, gone the next – while others transform our instructional process and we hold onto them, because they work. I really think GID is in the latter camp. Guided Inquiry Design is a student-centered approach to learning that allows students to explore questions, ideas, and resources in order to further develop their thinking or understanding of a topic while allowing for genuine openness to others’ perceptions, end products, and learning outcomes. Since education is beginning to swing away from the standardized-based testing and into more hands-on, curiosity-based learning, our students need adults in their educational lives that will provide these opportunities to be curious, to inquire, to wonder, about their world and guide them to appropriate resources to find the answers they are looking for. Librarians are in such a perfect position to facilitate GID in their schools. We work with all departments so it is easy for us to approach teachers with relevant, specific ways to integrate GID into student work and their curriculum. Since we collaborate with many different teachers, we can model how to facilitate lessons that are GID based and provide the additional resources they may want to include but don’t have the time to look for or include in their ordinary lessons. Our Standards for the 21st Century Learner, created by the American Association of School Librarians (AASL) include Inquiry as one of the primary foci for students. We help students find whatever their looking to learn more about, whether its in print or digital form. We help students with developing good research questions, researching effectively using Google and other search engines, and we provide suggestions when what they find isn’t what they were looking for. This is what we naturally do as librarians. So much of this is aligned with GID that it’s almost a seamless integration into the services we offer our students: asking good questions, immersing themselves in the situation, exploring resources and identifying and gathering the ones they feel are significant, creating the product or idea, providing forums & space for students to share their ideas and work with others, and teaching them to evaluate if what they’ve created and learned was successful. THIS is what we do, and this is a highly successful approach to teaching and most importantly, student learning. When we as librarians can explain to our teachers that not only is this “initiative” or way of thinking & teaching similar to the natural research process, and it’s also what we as librarians already do, teachers may be more willing to try this approach in place of a teacher-focused lesson they’ve used for the last 15 years. Our students don’t learn the same way that we did when we were in school, and they need new approaches to research and learning. GID is the answer. As a middle school librarian, I can only feel convicted myself by this blog. I need to do better outreach to my teachers, more research into specific projects & curriculum to target to make GID most appealing, and how collaborating with me as a librarian will not only enhance their experience but also their students’ learning. Our students wonder all the time. They’re curious about the world they live in and the topics they learn in school. As a librarian, I need to do a better job of bringing the wonder and curiosity into all curriculum using GID. My students (and yours!) deserve it. One of the things I love most about my job as a middle school librarian is that I get to work with every department and every grade level. I work with some departments more than others, and a goal of mine this past school year (since it was only my second year there as librarian) was to work with my seventh-grade United States History staff. They were looking for a way to assess the end of a recently-taught unit, 1890-1910, using their class sets of laptops. We tossed some ideas around and I introduced the idea of Guided Inquiry, with which they were unfamiliar. After a quick overview, they were sold. We decided to pose the question to students: Which event, person, or invention from this time period had the most effect on its time period, today, and will have the most effect 50 years from now? We chose the outlet Padlet.com, a free online curation site, to display their work (which was also unfamiliar to them), although students were able to use any platform they wished to display their ideas. After some quick instruction in finding resources – they all had to be digital – and reminders for how to cite digital sources, students reviewed the time period, their notes from the unit, and did some research into some possibilities. Students had a few class periods to work on their projects. I assisted occasionally during these work times, answering questions and also asking some that would fine tune their thoughts. On the day their projects were due, students had the opportunity to review each other’s work, filling out a peer-response form that asked about what the project did best, places for improvement, and general comments. Many of the students remarked how much more they learned about topics by looking at what others had done. The creativity of students was outstanding! See below for an image, and here to see some of the best ones. Looking back, I liked that this project generally followed the GID process, but we made it a bit more casual for my first attempt with a new department and their first attempt with both GID and Padlet. When asked at the end of the project, students said that this was one of the best end-of-unit projects they did and that it was so much more engaging than a test or another paper/pencil assessment. Students completed the research process,including citations, but in a digital way and on a topic of their choice. The teachers stated that some projects were better than others – which is normal in a middle school classroom – but students were consistently on task and engaged with what they were working on. The teachers also agreed that this project is something they would do again this next school year, and that the quality of work was better than typical assignments/projects they had assigned earlier that year. If I were to change anything about this project, it would be to delineate more of the process, perhaps curating a few resources for them on the time period and pointing students to databases (and perhaps doing some instruction on advanced Google searching) that could give them some more ideas. As a librarian, I appreciate that GID gives me additional opportunities to collaborate with teachers who are looking to transform their students’ learning. It helps the staff to see for themselves that I don’t just check out books but I am an instructional partner as well. Sometimes teachers know it in theory, but it’s assignments like these using GID that help reinforce that to them. I’m looking forward to doing this project again (and hopefully others!) with them during this upcoming school year! Hi! I’m Rachel Grover, the guest blogger for this week, and I’m a middle-school librarian in Fairfax County, Virginia. With just under 200 schools and over 160,000 students, we are the largest school district in the state of Virginia. Prior to being a librarian, I taught 5th grade for two years and middle-school English for five years. 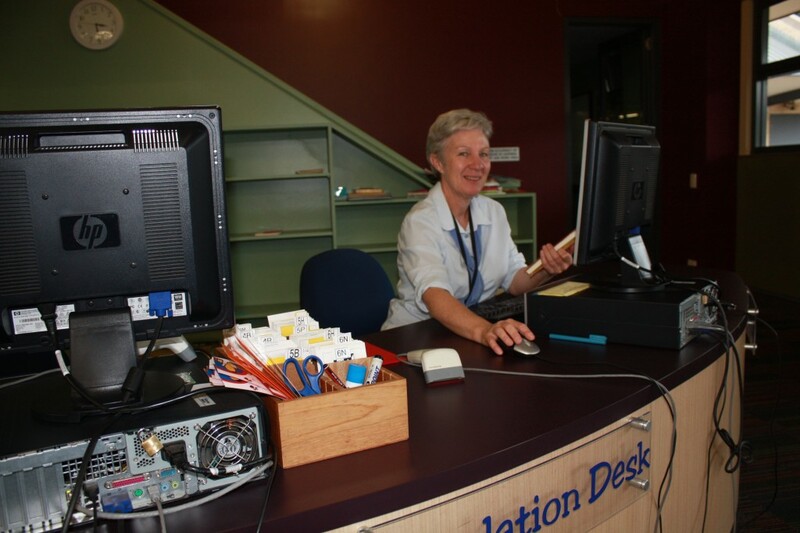 This will be my 3rd year as librarian – 10th in education! – and I am absolutely in love with my job. I love being able to have influence on the entire staff and student body, not just my own classroom, especially when it comes to sharing resources, helping to guide uses of new technology, and modeling lessons using new methods of teaching – like GID. When my library supervisors introduced GID to all the librarians in our county, many of my thoughts were about how perfect of a position librarians are in to help teach this method to our staff. I found myself intrigued with how to transform what we perceived as effective lessons into more student-centered, student-engaged lessons. Since our introduction two years ago, I have used GID with history, Latin, art, and English classes! It always astounds the teachers how much more engaged students are and the quality of work GID produces. Stay tuned for the next entry, which will detail examples of specific lessons I’ve done with these teachers and why middle school is a great opportunity to get students involved with GID. A recent example of my Guided Inquiry work has been with a unit for Year 4 students on National Parks in Australia. This subject is close to my own heart as I am a bird watcher, bush walker and generally outdoors person. I have found that if you have a passion for an area of inquiry, then it helps to make it a great topic for Guided Inquiry! We began our ‘Open’ session with photos of my trips and guessing what might be packed in my backpack. It included erecting my tent in the library space, which led to lots of excited discussion. During the ‘Immerse’ stage the classroom teacher and I had gathered a wide range of material including pamphlets, brochures, books and videos. We planned a round robin of immersion activities and began to find some interesting ideas that students wanted to investigate further. Co-incidentally Sydney was covered in a smoke haze from controlled burning in National Parks, so this made a great bonus for an inquiry. Our ‘Explore’ phase included a phone hook-up with a Park Ranger, which led to further questions and answers. During the ‘Gather’ stage we used an Inquiry Log. I always find this stage the most challenging with each young students pursuing their own inquiry. Students were given a choice of ‘Create/Share’ activities, however most constructed models of imagined National Parks, incorporating much of the information they had gathered throughout the process. ‘Evaluate’ enabled students to self-evaluate the process as well as the classroom teacher and I to evaluate whether we had achieved our planned outcomes. Hello, this is my first blog post on the 52 Week GID Challenge. Thanks for setting it up Leslie, it has made interesting reading! My name is Margo Pickworth and I am the Teacher Librarian at Shore Preparatory School, a very large independent school in Sydney, Australia. 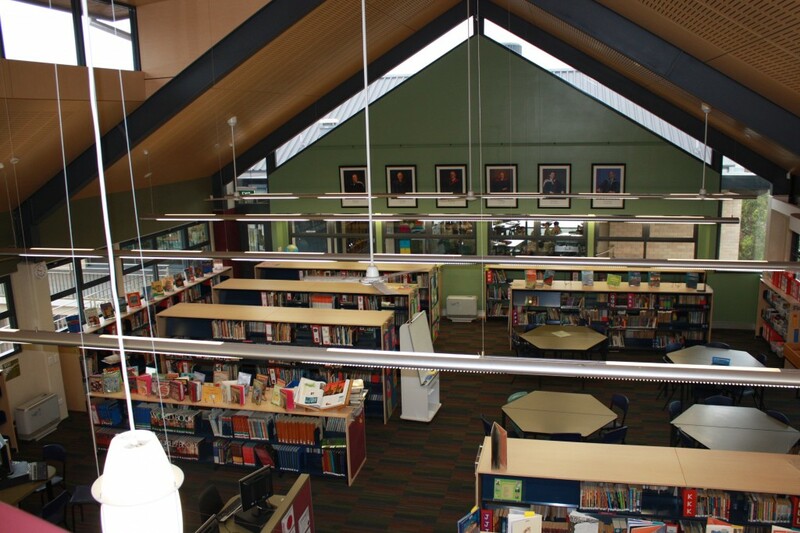 My role as the teacher librarian involves not only managing the school library resources, but planning units of work with classroom teachers to implement syllabus documents, particularly with a focus on inquiry. I first became interested in Guided Inquiry when Ross Todd spoke fondly of the work of Carol Kulthau in his visits to Australia. I was then fortunate enough to attend the CiSSL Summer Institute at Rutgers in 2014. Since then I have attempted to implement Guided Inquiry in my own context. There has been some ups and downs some of which I will share over the next few posts. My professional journey has certainly been one that has traveled down a winding, some would say perilous, path. 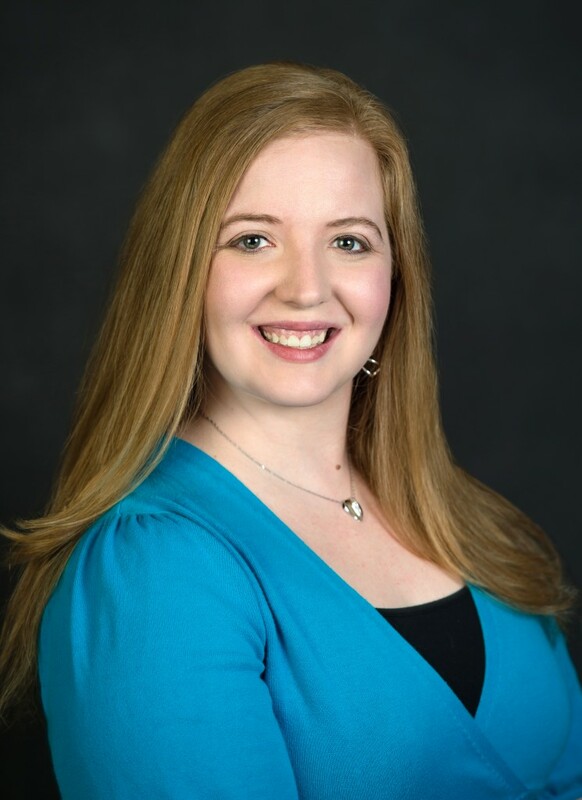 From a liberal arts degree in theatre to a Masters in Curriculum & Instruction. From waiting tables, to teaching AP English, to Innovation Specialist, librarian and tech integrator, to PhD student and Instructional Technologist – I have definitely been one of those Robert Frost had in mind when he penned his famous poem about the road less travelled. But through it all has been a common thread, holding everything together around a thirst for learning. What I have discovered most recently, however, is that my greatest passion lies in helping others to best disseminate their own considerable passions and knowledge. 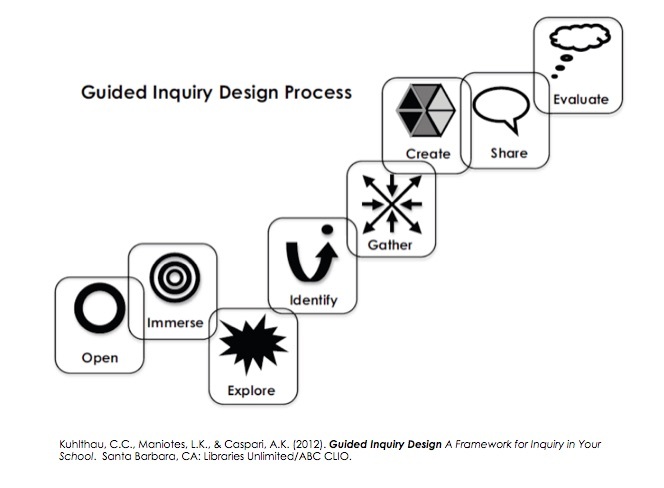 Being able to share the Guided Inquiry Design (GID) framework as a pedagogical cornerstone is something that will forever be an emphasis in my instructional design. Once I experienced the Guided Inquiry Design (GID) process with the National History Day (NHD) project, and witnessed the students’ engagement and excitement for research, I knew I had to replicate that process in my other writing classes. I’m going to describe a writing project I routinely used in a very technical course with time at a premium. My class that continually proved complicated for research instruction was my Senior Composition Honors class. The class was designed to be extremely practical for students. It was unique in that the goals of the class included preparing students for college writing and/or occupational writing, while also granting technical college credit in composition. It was a diverse group of students, to say the least. Students wrote various essays, created functional resumes, applied for scholarships, and completed their college applications. My job was to introduce them to as many different types of writing as might be found in their future endeavors. And…to make things more complicated, I only had a semester in which to do it. As you might imagine, finding time for realistic research was nearly impossible. Anyone who has taught a research project in a large class knows that it takes a significant amount of time. Before using GID, research projects took a minimum of 6-8 weeks. Often, they would stretch on well past that constraint. Much time was wasted and keeping students on task was a constant battle.